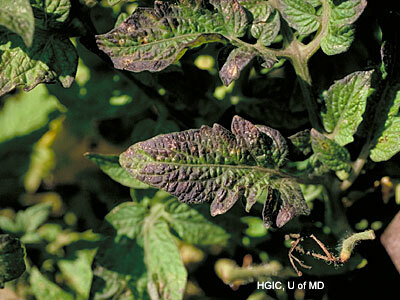 Phosphorus deficiency is a common problem on tomato leaves. Phosphorus is one of the Big Four macronutrients that tomato plants need in order to be healthy – nitrogen (N), phosphorus (P), potassium (K), and calcium (Ca). In fact, the first three are known as the N-P-K ratio in fertilizers. Fertilizers of all kinds are labeled with three numbers (such as 5-10-10) which indicate each of the three nutrients’ percentage amounts in that product (in this case, 5% nitrogen, 10% phosphorus, 10% potassium). Each of these nutrients has a specific role in growing healthy plants. In simple terms, phosphorus is a converter. It is a nutrient converter. When other nutrients come into the tomato plant, phosphorus helps convert them into usable building blocks (proteins and nucleic acids), which allow the tomato plant to grow. It is an energy converter. Phosphorus is a go-between for two kinds of energy in the metabolic process: high energy (ATP) and low energy (ADP). As ATP (high energy) loses phosphorus, it releases energy. That creates ADP (low energy). Then ADP gains phosphorus, turning back into ATP. Phosphorus is important during each step of a tomato plant’s life cycle. What Causes Phosphorus Deficiency in Tomato Plants? What Does Phosphorus Deficiency in Tomatoes Look Like? Tomato leaves become purplish (or reddish-purple), most often first on their undersides and later on the tops. Here’s why: when phosphorus becomes unavailable, energy cannot be converted. Sugars pool together, producing an abnormal dark-green color. This allows anthocyanin pigments to develop, producing a reddish-purple color. Tomato leaf veins, leaf stalks (also called “petioles”) and tomato stems may become purple, too. In severe cases, an entire tomato plant can take on a purplish color or its already-purpled veins may turn brown. Over an extended time, tomato leaves may turn blue-gray. Leaves on affected plants may curl. Phosphorus plays a key role in the growth process. If your tomato plant can’t convert nutrients to energy building blocks or can’t gain and release energy, then the plant can’t grow. Phosphorus-deficient tomato plants grow slowly. They are often dwarfed or stunted and may appear to be younger plants or stressed plants. Once-healthy plants lose vigor. When Does It Affect Tomato Plants? Without enough phosphorus in the soil, tomato plants will grow slowly – particularly early in the season. In mid- to late season, deficient tomato plants will produce smaller fruit and less fruit. During early season or late in the season, the garden soil can be cool. Tomato plants struggle with phosphorus uptake in cool temperatures. They prefer soil temperatures of 60º F or more. (Here's what to use to take your soil temperature.) Once the soil temperature warms, then tomato plants are able to absorb phosphorus and the problem fixes itself. Clogged soil pores prevent phosphorus uptake. How Do You Control and Treat Phosphorus Deficiency in Tomatoes? Do test nutrients in your soil. Check the nutrient balance with a simple soil test kit. Amend it with phosphorus as indicated in soil test results. Good organic sources are bone meal and compost. Good inorganic sources are rock phosphate and super phosphate. Do test your soil’s pH. Use a pH soil test kit or pH meter. Tomatoes grow best in slightly acidic soil with a pH level between 6.0 and 7.0 – optimum is between 6.5 and 7.0. At alkaline pH values (greater than 7.5) and acidic values (less than 6.5) phosphorus becomes less soluble and is not readily absorbed. If your soil’s pH isn’t within 6.5 and 7.0, make proper adjustments. Don’t plant tomatoes too early in the season. Use a soil thermometer to ensure that temperatures are at 60º F or more before you set plants in the garden. Do warm the soil before planting. Spread black plastic or plastic mulch over your garden several weeks prior to setting tomato plants in the ground. Do add plenty of organic matter to the soil before, during, and after the season. Garden humus includes phosphorus. Other nutrients also bind to phosphorus to ensure that the nutrient isn’t leached from the soil. This is particularly helpful in sandy soils, which drain too quickly. Do use a balanced tomato fertilizer throughout the season. Incorporate the fertilizer into the soil rather than leaving it on the surface. This way, nutrients will be more readily available to the plant. If you discover a phosphorus deficiency during the season, use a seaweed spray or fish extract spray, applied directly to the leaves, to stimulate the plant’s enzyme system and encourage phosphorus absorption in the short term as you work long term to amend the soil. Do add rock phosphate to your compost pile during the fall or winter to ensure the nutrient’s availability for next year’s plants.